World-renowned puzzle inventor Ivan Moscovich is the designer of this fascinating Mirrorkal Escher. The design and concept is similar to the Mirrorkal - You and Mona Lisa, also invented by Ivan, although the mechanics and the way you manipulate the puzzle is totally different. Curiously enough, Ivan actually met M.C. 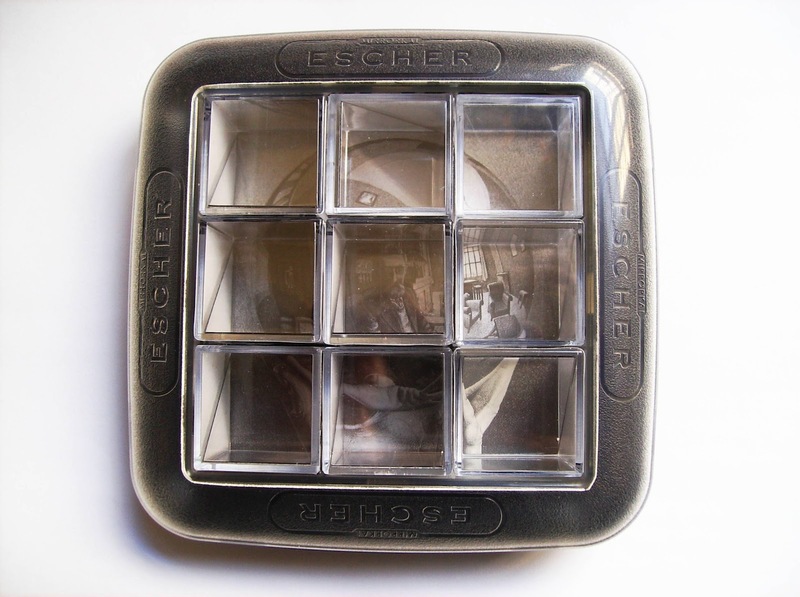 Escher in person, back in 1964. 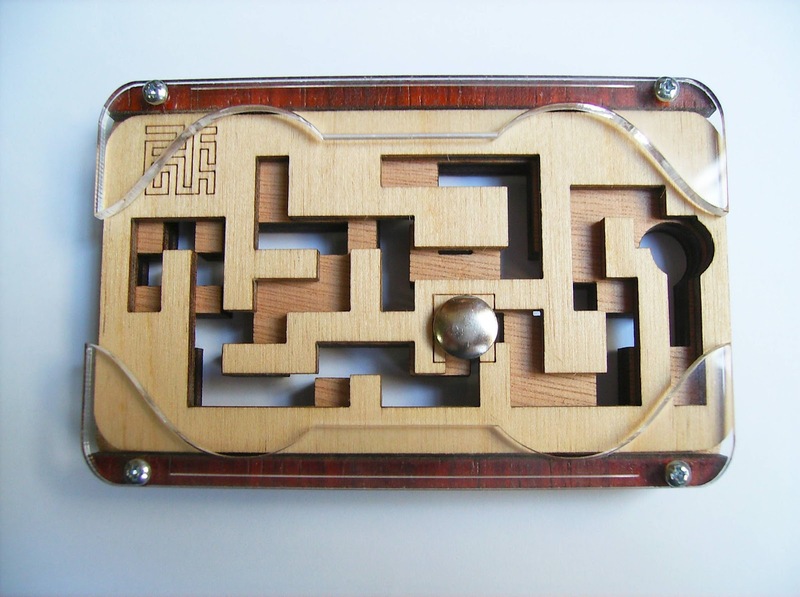 The main difference between the two Mirrorkal puzzles is that the "You and Mona Lisa" is basically a slide puzzle and the blocks are confined to frame. 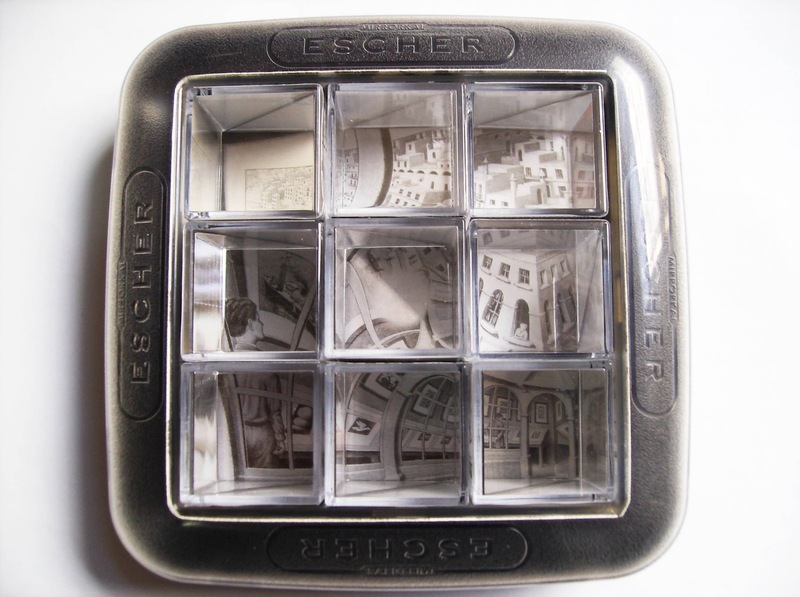 In the Escher puzzle, however, you can hold and manipulate each block how you want, sort of... Although, don't think for a minute that this particularity makes the puzzle easier. On the contrary, as I found the Mirrorkal Escher to be much more challenging, because ultimately, it has many more possible combinations - Wrong combinations, if you will. If you've never played with a Mirrorkal puzzle before, I'll explain the basics. 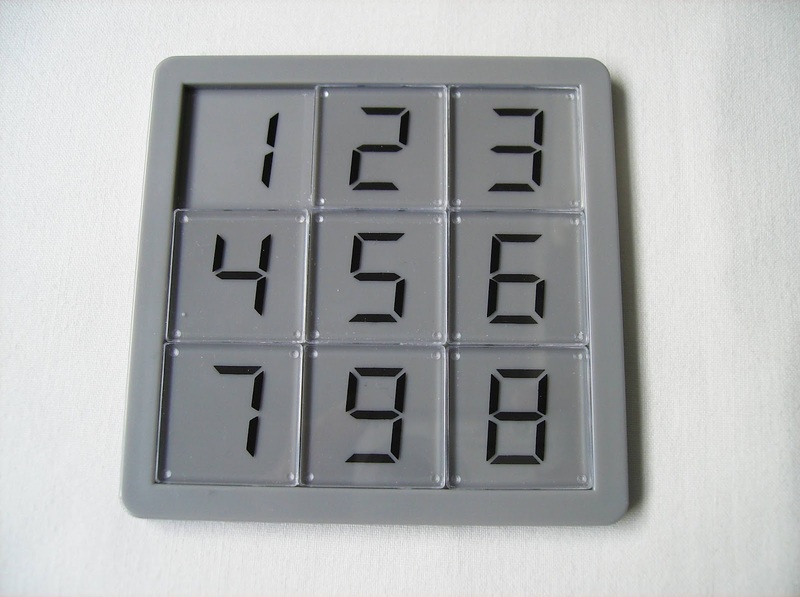 You have nine blocks, each with four pictures covering all faces except for two, which are left blank or transparent. These two faces that are adjacent to each other, have a strategically placed mirror parallel to their common edge. When correctly placed in the frame, the mirrors will reflect each of the nine picture fragments and compose a whole image. 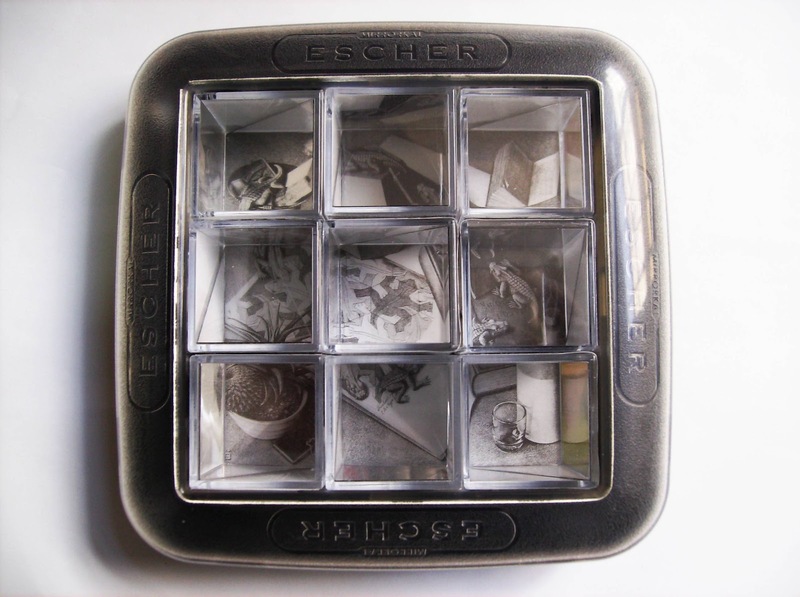 Featured in the puzzle are five of M. C. Escher's most famous images. Each block is roughly 3cm in length (1.18"), so including the sides of the frame, the entire puzzle measures about 13cm (5.12") in length. Since all nine cubes don't have the necessary picture fragments due to the use of the mirrors, you can find the remaining ones inside the walls of the frame. These wall fragments are very useful to know the picture orientation and actually help you to plan where to place each block. A nice design feature found in the frame is that there are nine holes in the actual place where each block goes, allowing you to easily remove any incorrectly placed one. Solving any of the five images can be a little challenging, particularly your first one. After you get the hang of it, the last ones can be solved in about 5 minutes. The logic you have to follow is to know exactly how each picture fragment will look after being reflected. If you look closely to a fragment on a block and its counterpart on the puzzle's leaflet, you'll see that the one in the block is actually mirrored. When you use the mirror to reflect the image, it'll show it with the correct orientation. The first thing you have to do in order to solve a specific image is to separate the blocks that have your picture fragments from the ones who don't. Those few blocks that don't have your fragments will only serve for reflection, so use them wisely. Next, find the correct orientation for the frame, seen from inside the frame's walls and start placing the most obvious ones first. As you place more blocks, it'll become clearer where each one goes. 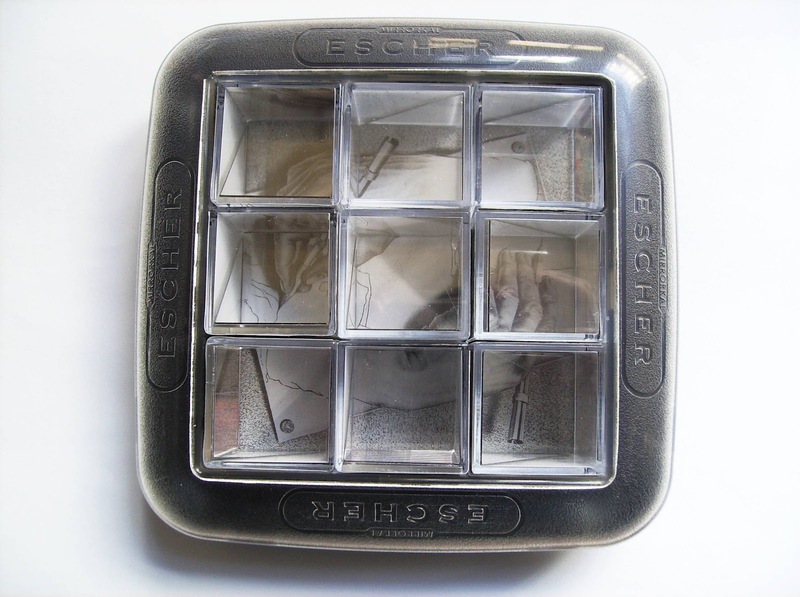 The Mirrorkal Escher is widely available in the market and you can find it pretty much at every large online puzzle shop. The Recent Toys website, which is the distributor, only does wholesale. I really enjoyed solving all five puzzles. 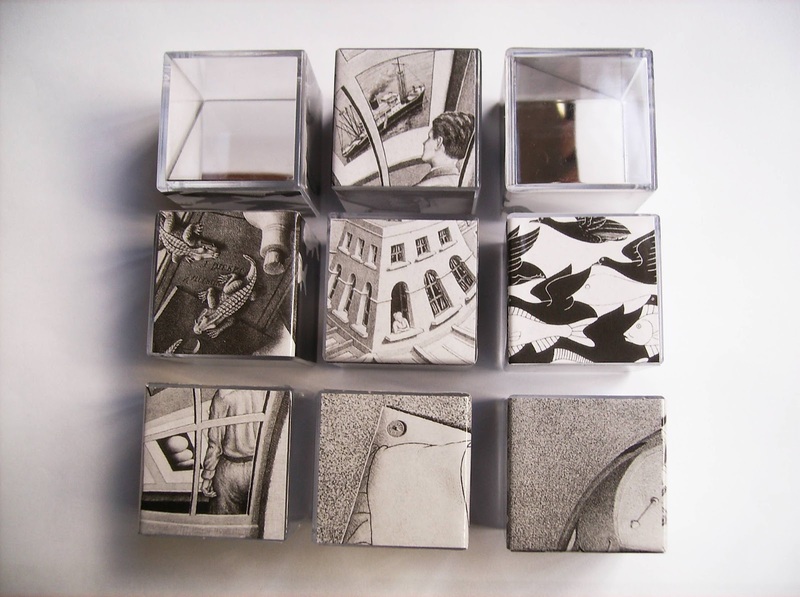 Ivan Moscovich did a wonderful job at transforming Escher's images into a magnificent puzzle. The use of mirrors is a fantastic concept and I can see anyone being captivated by its original design and the mesmerizing images. Today, I have another Jean Claude Constantin puzzle for review, the Two Keys. It's starting to become a trend... And I still have several more of his designs waiting to be reviewed, so do stay tuned. 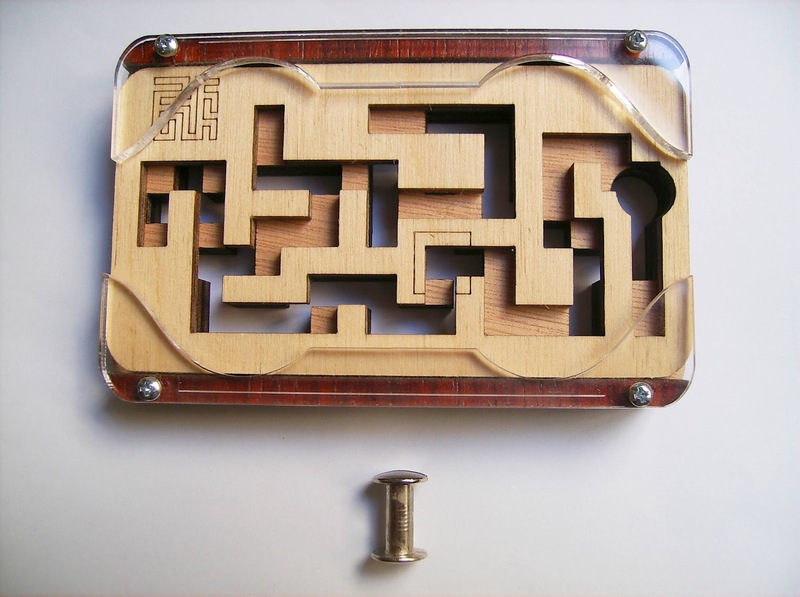 The Two Keys is a Maze or Route-Finding puzzle, or double maze to be more precise, and your task is to get the pin from its starting point to the end and remove it. This would have been a pretty simple challenge had the second maze, which is very different, not been there to complicate things. 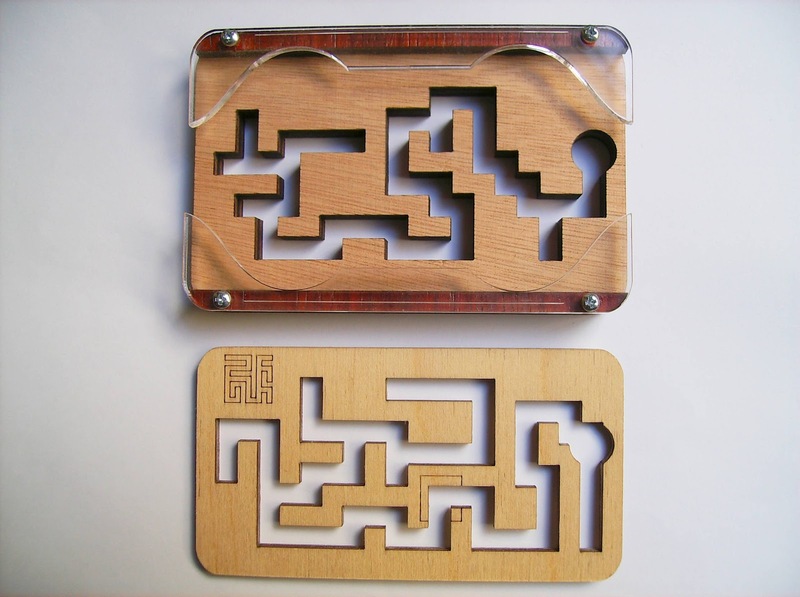 To navigate around the maze you need to slide the top platform left or right according to the movement you want to perform, so that both mazes have a common pathway. The puzzle is relatively small, measuring about 10cm x 6.5cm (3.94" x 2.56") and it's laser-cut from plywood. Adding for a very nice finishing touch are two acrylic pieces placed at both top and bottom. The difficulty is a bit harder than I was expecting, because the solution is not so straightforward as you'd think. I had to go back and forth a few times, facing a couple of dead-ends in between, before I was able to find the right path. PuzzleMaster rates it at 5/10, the easiest, but even though I was able to solve it in about 10 minutes, doesn't change the fact that it's still a complex design and I believe more casual puzzlers will struggle to figure it out. If you're a regular reader of my reviews, then you know that I'm a big fan of Constantin's designs, and the Two Keys is certainly not an exception. 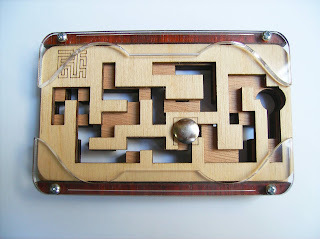 While it's not a new concept (Oskar's Medallion and Cast L'œuf are another two examples), the design is very well done and I can recommend it to any maze enthusiast. The Rashkey was invented by Oleg Raschkov in 1999 and it's a Rotational/Rearrangement puzzle. 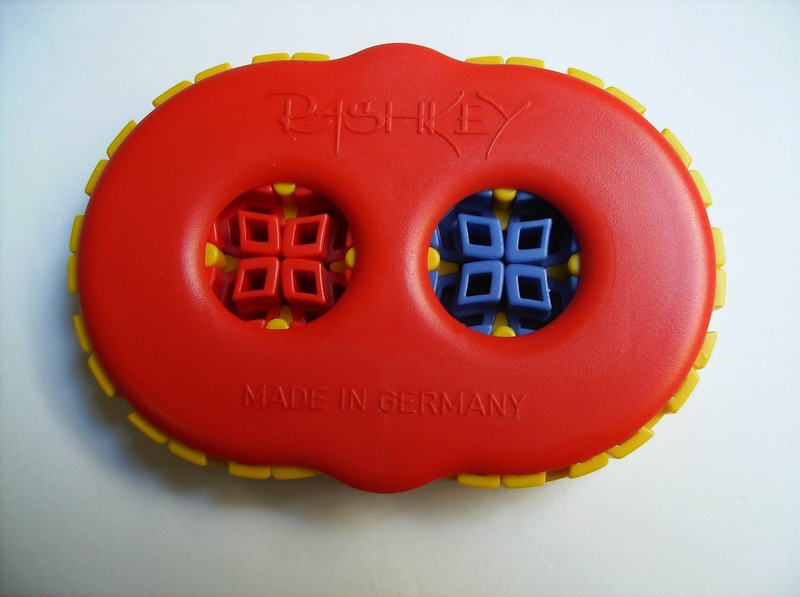 It comes in three versions: the Rashkey 1, which is the one I have, the Rashkey 2 and the Rashkey 3. They differ in difficulty with the 1 being the easiest and the 3, the hardest. The puzzle is comprised by two overlapping disks with centers separated by a radius in length. The version that I have has three colors, with predominantly yellow and red and blue for each disk center pieces. You maneuver it by rotating it at 90º at a time. One thing that I was surprised to find out when I first got it, was that it's much smaller than I was expecting it to be, at about 7,5cm (2.95"). What makes the puzzle easy to solve is the abundance of yellow pieces (25), contrasting with only four red and four blue pieces. Since each ring shares two pieces of its four center ones with the other ring, the number of possible positions is much smaller (44.100), compared with 4.961.250 in the Rashkey 2 and 13.335.840.000 in the Rashkey 3. - Numbers taken from Jaap Scherphuis' website. Solving the puzzle for the first time can still be a little challenging, despite the level of difficulty. It took me about 15 minutes for a first solve. After getting the hang of it, I can solve it under 5 minutes. Besides the basic pattern, you can solve it to other few designs as well. Unfortunately, the Rashkey is not widely available anymore, but you can still find it in a couple of places. I bought mine recently from Milan Vodička, but you can also find the versions 2 and 3 from Hendrik Haak. They occasionally appear on eBay as well, so you might want to check regularly (or save a search on eBay with e-mail alerts). 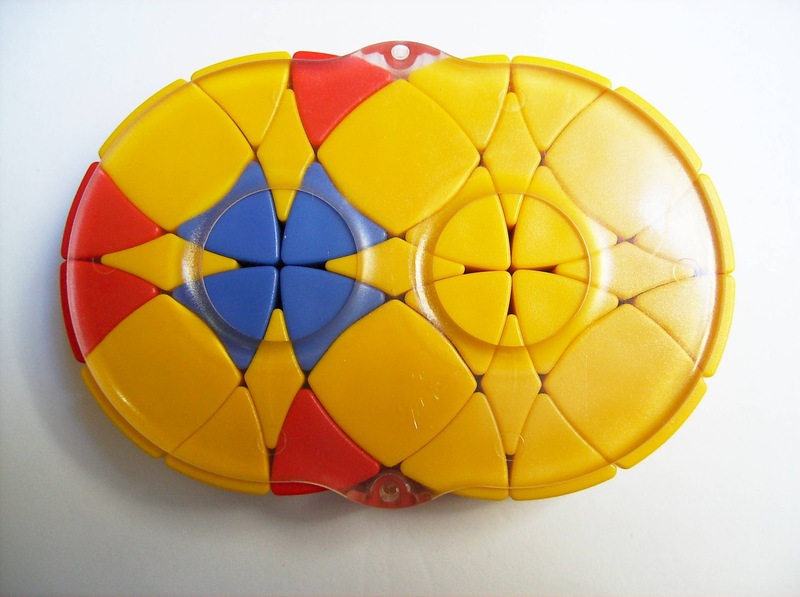 If you like this type of puzzles, you can also check the Arusloky website, as they are widely available. I have one in my collection and they're very interesting too, with many different challenges. 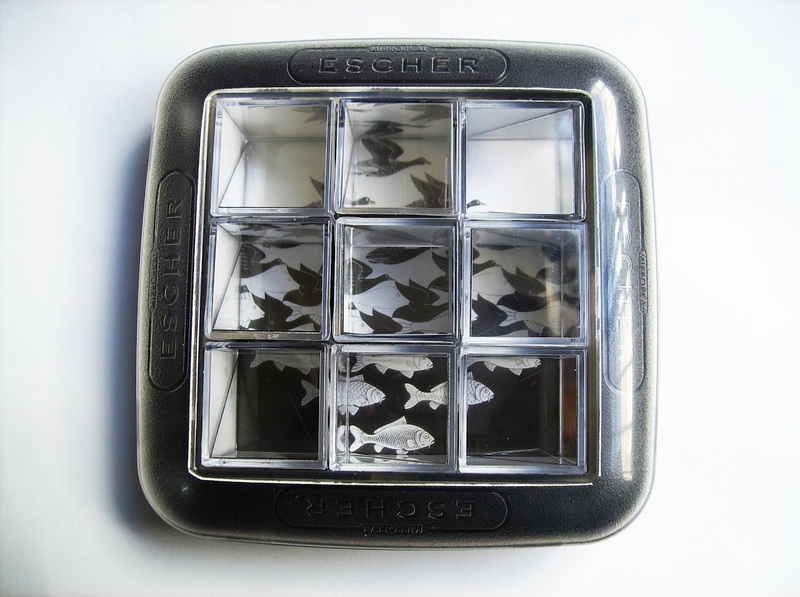 The Puzzler is also a similar design, in three versions (see here, here and here), but this is even rarer to find. Even though the Rashkey 1 is the easiest version from the three, I chose to get it because it was the one that caught my attention the most, for its striking resemblance to two four leaf clovers. While it may be easier than the other two versions, it's very fun to solve nonetheless. 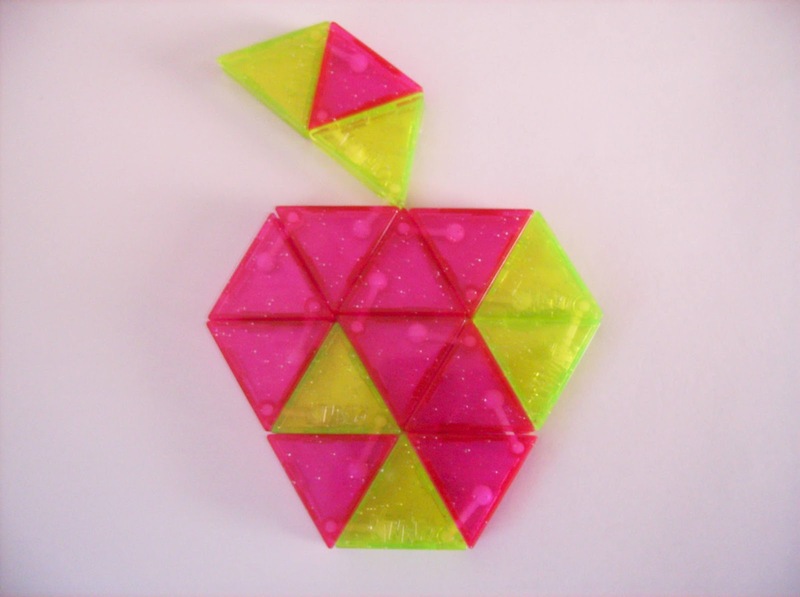 PuzzleMaster has a great wide selection of Wire Puzzles on their website, manufactured by them, and The A Puzzle, from the brilliant mind of puzzle designer Jean Claude Constantin, is a good example of this. The goal of the Wire Puzzles is always to disentangle or separate a part of them, whether it's a ring, a string or, as in the case of The A Puzzle, a handle. Good thing it doesn't have a string though, as those are a nightmare to solve, mostly because they can easily become quite entangled in the frame. Besides the ring at one end of the handle, there are two others in the A frame. These two rings prevent the handle to simply pass to the end of the wire frame in the middle. Note that the ring found in the handle is the same size as the other two, so it won't be possible to just pass it through them. Also worth mentioning is that the two rings can't move much around the frame, so you have to find a way to get the handle past them. For a 7/10 difficulty level, this one proved to be much harder than I was expecting. It took me a couple of days with constant fiddling to finally see the handle off the A. Nevertheless, it sure was a great feeling having solved it, after so much unsuccessful tries. One thing about this type of puzzles, at least for me, is that frustration kicks in pretty fast after I run out of ideas on how to tackle them. I have to take several breaks in between to refresh my mind before having another go. I find that with Wire Puzzles it's always a bit difficult to explain the solving process in words, so I'll just give you a couple of pointers. Spoilers ahead: When thinking of a way to solve a puzzle like this, it's good to have an idea of where might be the exit for the part being separated. This exit is found in the middle of the right ring, the one that's attached to a little loop, in the gap between the loop and the frame. Another important step to keep in mind is that you need to make the left ring pass between the handle and in turn, make the handle go around the middle of the frame. There is another couple of similar steps, but after this it should be solved in no time. If you still need a graphical solution, download one here. 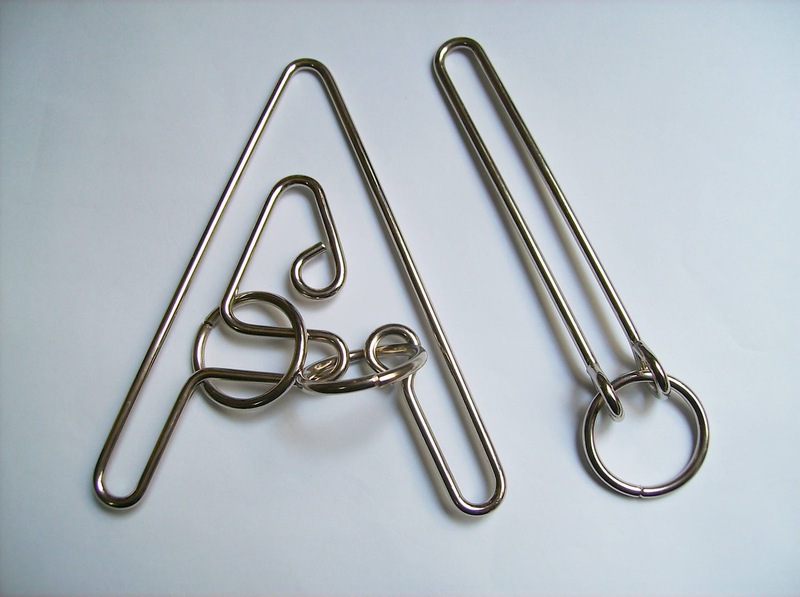 The A Puzzle can be found at PuzzleMaster, along with many other Wire Puzzles. Despite being a little harder than expected, and although not the most difficult I've tried, The A Puzzle was still a lot of fun to solve. Yes, it can be a little frustrating at times, but that's the fun of solving puzzles - they're a challenge and a test to our resolve. 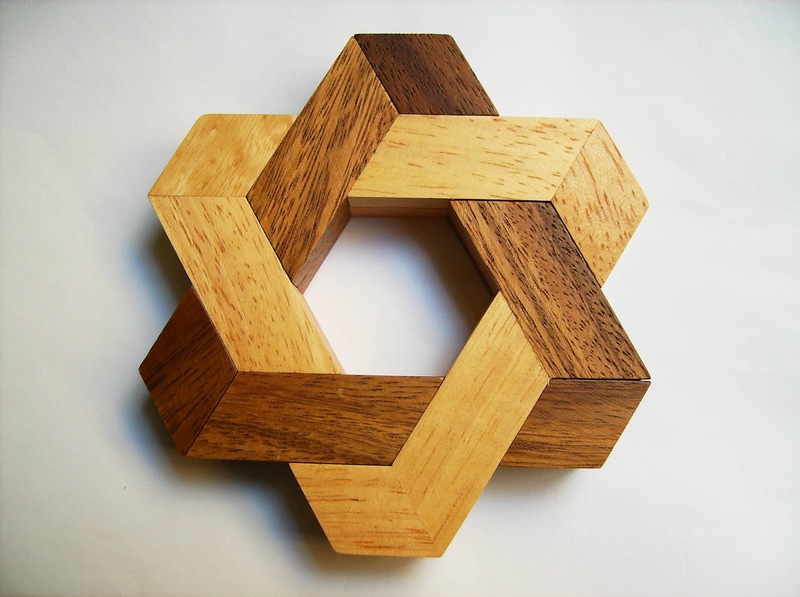 The Kinato (also known as Smart Kinato or Kinato 16) is a very nice Assembly/Pattern puzzle that I recently bought from the Meffert's store. It was invented by Lawrence Lau and manufactured by Jeruel Industrial. It was entered at the 22nd IPP Design Competition, in 2002 and a year later, two other versions, the Hexagon Kinato and the T-Kinato were also entered at the 23rd IPP. 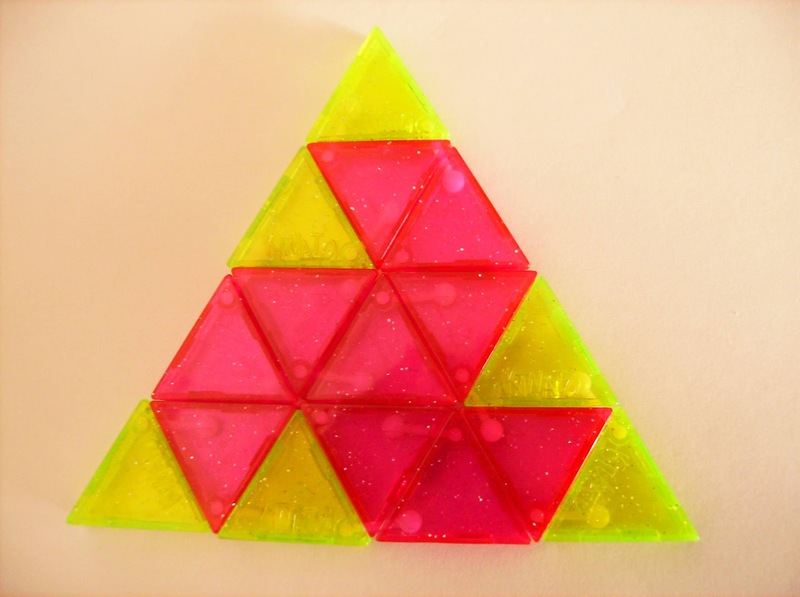 The puzzle has two contrasting colors and is comprised by 16 plastic equilateral triangles, 10 pink and 6 green. 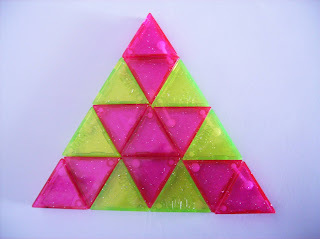 Each triangle is connected at one corner, and all of them linked together form a continuous chain that allows to build countless shapes, reminiscent of Tangram, or form within the limits of a large triangle tray (provided in a CD case), more than 80 patterns. 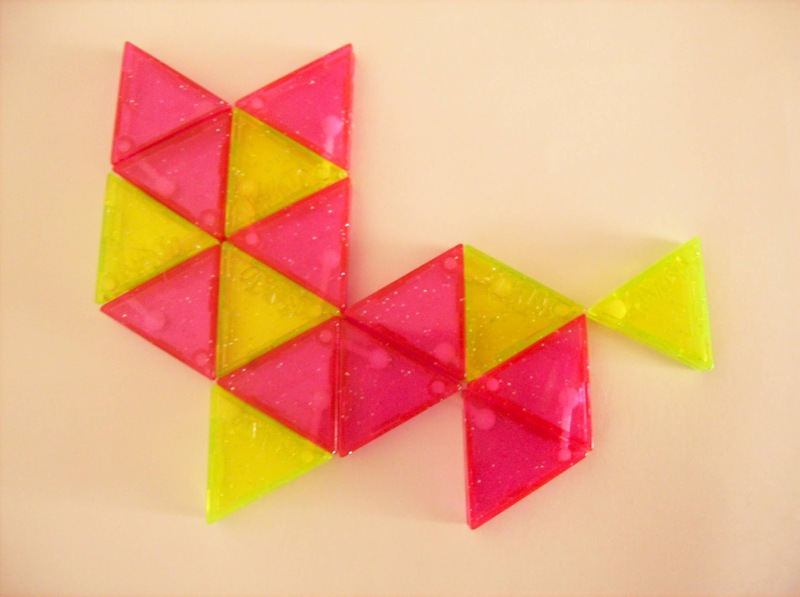 It's also possible to link one or more additional Kinato puzzles to make even more complex shapes. Since I'm a big enthusiast of Pattern Puzzles, I went straight ahead and tried to solve some of these first. 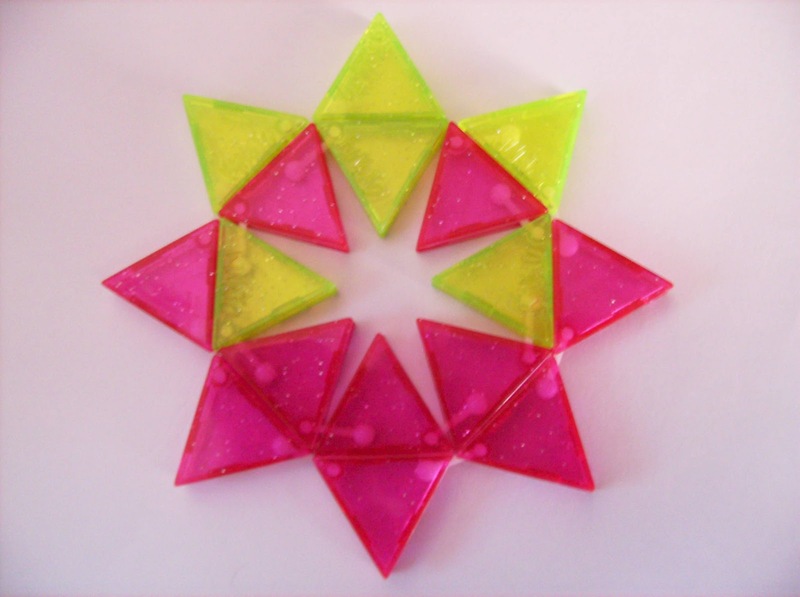 The triangular tray is very practical, as it's easier to get the notion of its shape limits. Any single triangle can be flipped upwards or downwards or turned from left to right. This way, you get total control of the chain's direction. One important thing to keep in mind about the chain is that it cannot cross itself. It's wise to plan your packing strategy before making any attempt on a particular pattern, otherwise you'll most certainly get stuck in the middle of it and have to start over again. Depending on the specific pattern you're trying to do, some of them can be quite challenging and starting at one corner of the tray won't always be the best option. Knowing the configuration of the stretched out chain is crucial to understand how they connect and ultimately, how to solve any pattern. Building the Tangram-like shapes can be very fun and challenging as well, although I found the triangular patterns harder to solve. Without the triangle walls of the tray to limit your movements, you have much more creative freedom to build any shape you like... Not only that, but there's hundreds of possible designs you can create. Unlike the pattern challenges, color combinations are not important in shape creation, which is a huge help. Because the Kinato puzzle was released roughly ten years ago, it's now much harder to find it. I bought mine from Meffert's, but apparently it was the last one they had in stock and it wasn't even my first color choice. I believe it's possible to order from the actual manufacturer, but I'm not sure if they ship overseas. Ravensburger was the international distributor for the puzzle, but at least on their website they don't carry it anymore. Jigsaw Jungle in Canada still sells it, although it costs more than double the price I paid for mine at Meffert's. The Kinato is certainly very fun to play with. Even though the pattern challenges are a bit harder to solve, I enjoyed those the most. It's a shame about its availability, as it can be played by anyone, puzzler or not, but if you're a collector, I suspect you may already have one. Random Pick #16 from My Collection. It's been a while since I chose a random older puzzle from my collection to review, in part because all other previous reviews had been from recent acquisitions. Since these past two weeks, new puzzle arrivals have been kind of slow, I had to resort to my old treasures. 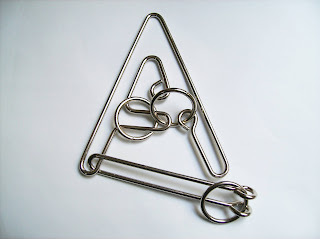 The lucky pick is a Jean Claude Constantin design, the Pins puzzle, or Three Pins, or Triangle Puzzle (from Hachette's "Classic Puzzles & Brainteasers" magazine), which is an Assembly/Packing problem. 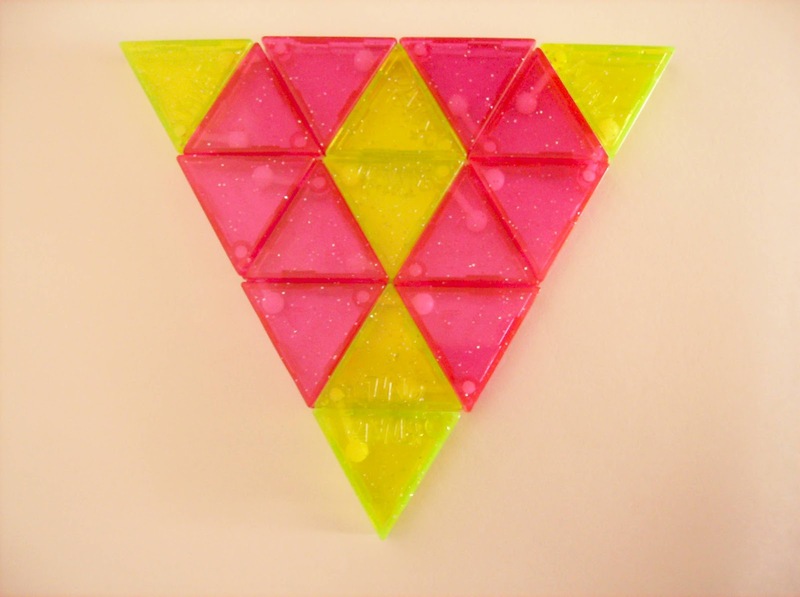 Honestly, I don't know why someone would call it Triangle Puzzle, because the pieces sure aren't triangles. 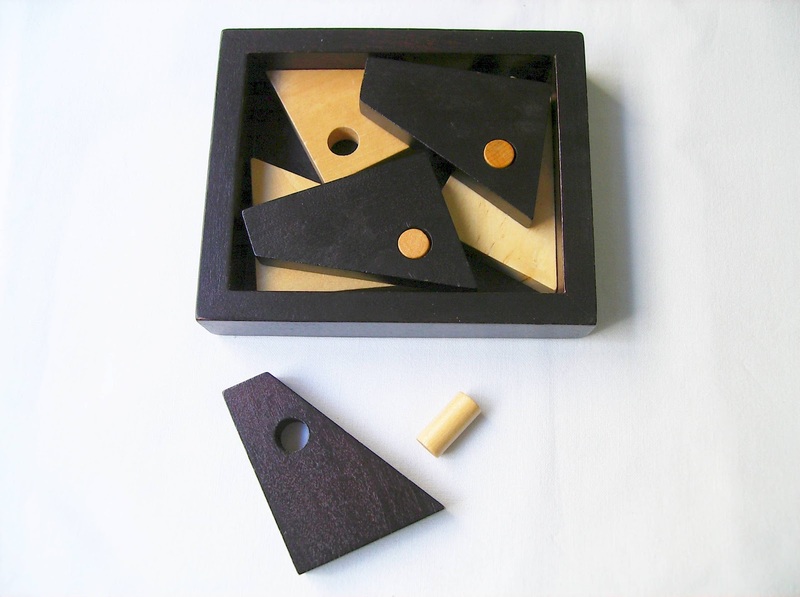 The puzzle consists of six identical wooden pieces with four edges, three dark toned and three light toned, and each one has a hole in a strategic spot. 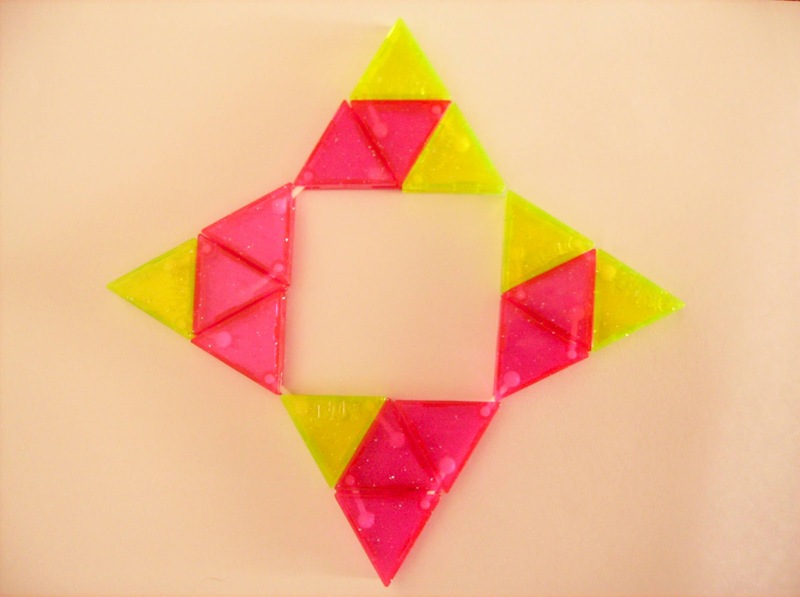 The goal (or goals), is to have each of the three pins go through two pieces, arranged in two layers, inside the tray. 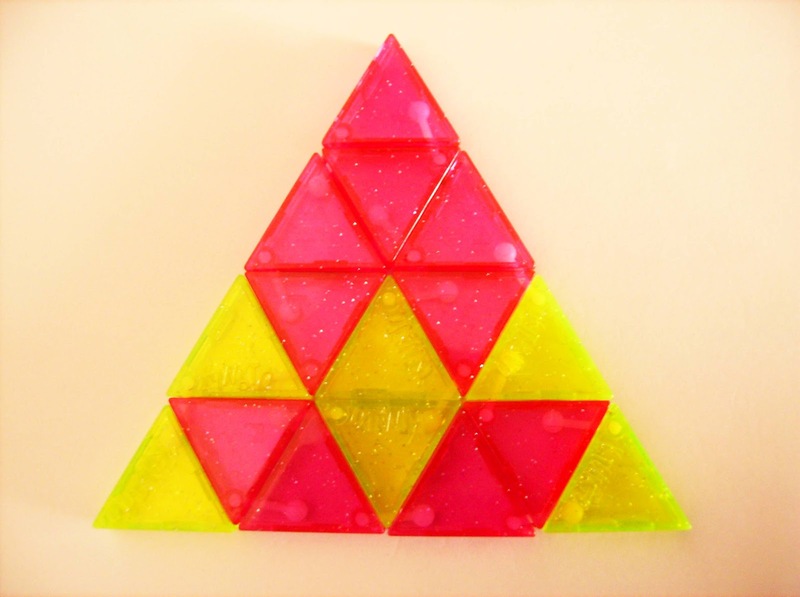 Each layer has to show three pieces of the same color tone, thus having two challenges: either solve it to show the top layer with the light pieces or the dark pieces. Solving this puzzle is moderately difficult, although not to the point of feeling frustrated. Note that even though the pieces are identical in size, the holes at each piece tone are at different places. This way, when you have the bottom layer figured out, the top one won't be so straightforward. The pieces don't need to be a perfect fit inside the tray, but just enough so that they won't overlap each other or go out of the frame. I saw this puzzle at Jean Claude Constantin's website and it's classified as a 6* level (the highest). I wouldn't go that far, maybe a 4* is more appropriate. A systematic approach with a bit of patience will solve this puzzle in about half an hour, so not your most difficult puzzle out there. If you solved the puzzle with one color tone and do the second challenge right after, it will probably be easier, because you just have to swap the top layer with the bottom layer. 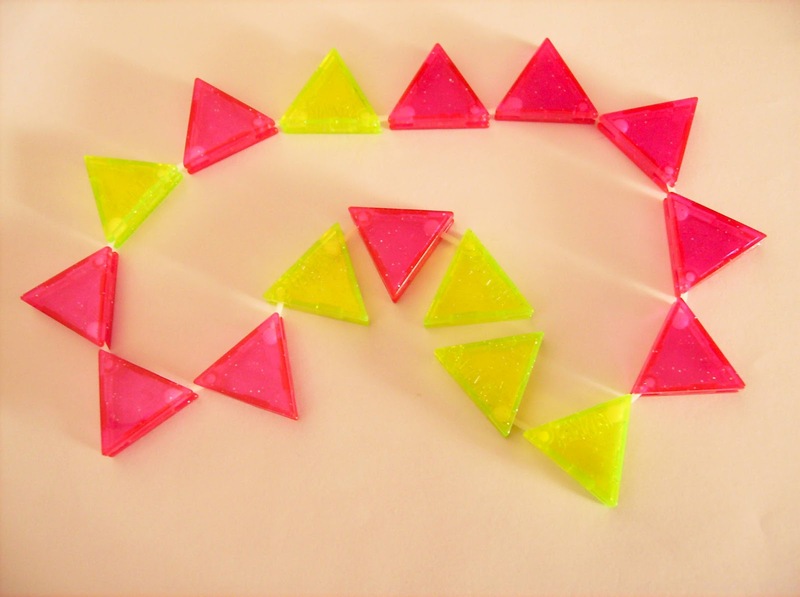 However, if you wait a few hours or more and dump the pieces on a table without looking at the actual piece arrangement, it can be as difficult as the first challenge. Each challenge has at least, two solutions, requiring just a slight manipulation of the top three pieces. If you want to check the solution for each challenge, click here and here. Availability on this puzzle seems to be quite scarce. I bought it in 2008 at an eBay auction, together with a whole lot of other puzzles. 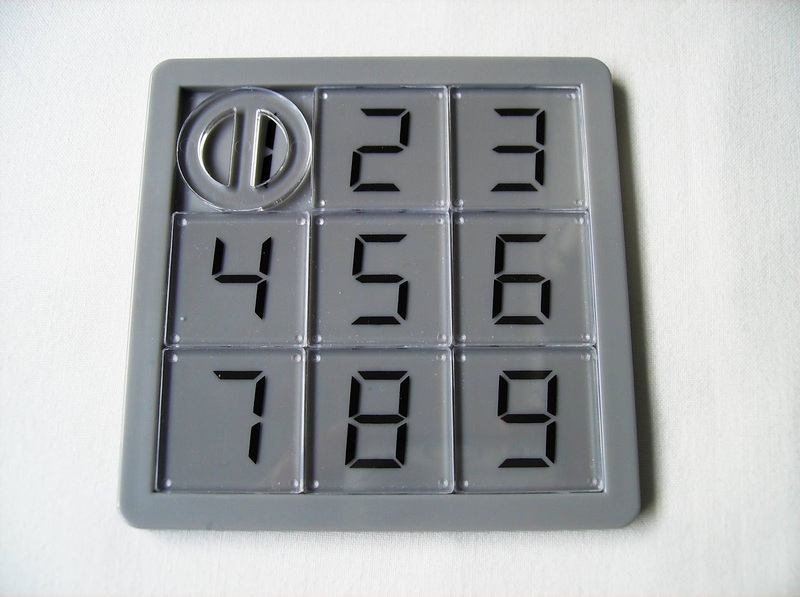 PuzzleMaster appears to have a version of this puzzle, but it's sold out at the moment, so if you're interested in getting one, try contacting their customer support and ask for a date on restock. It's always a pleasure to talk about puzzles from Jean Claude Constantin. His designs have always something different that you're not used to see in other puzzles of the same category, and The Pins puzzle illustrates that in full glory. The simple concept of having two toned pieces in order to accomplish two goals is quite extraordinary. Definitely worth a try and a must have in any collection. 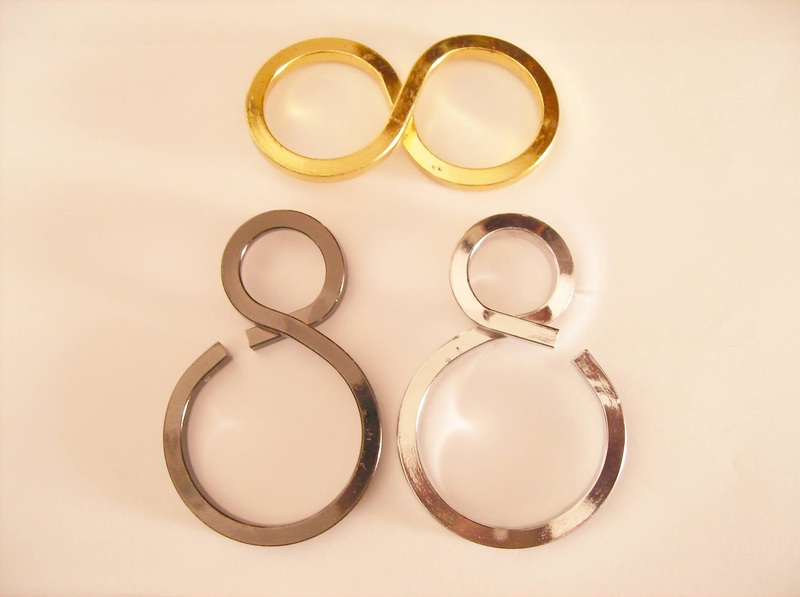 The Cast Puzzle Series may be the hallmark product produced by Hanayama, but they have many other different challenges and they're very interesting as well. 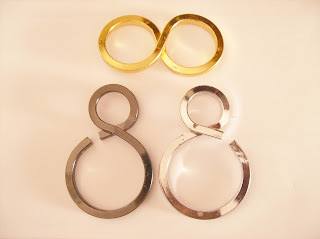 The Puzzle Impossible is a good example of the Hanayama's quality and originality. It was designed by Ukrainian Serhiy Grabarchuk Jr. and it's a Slide Puzzle with a twist. 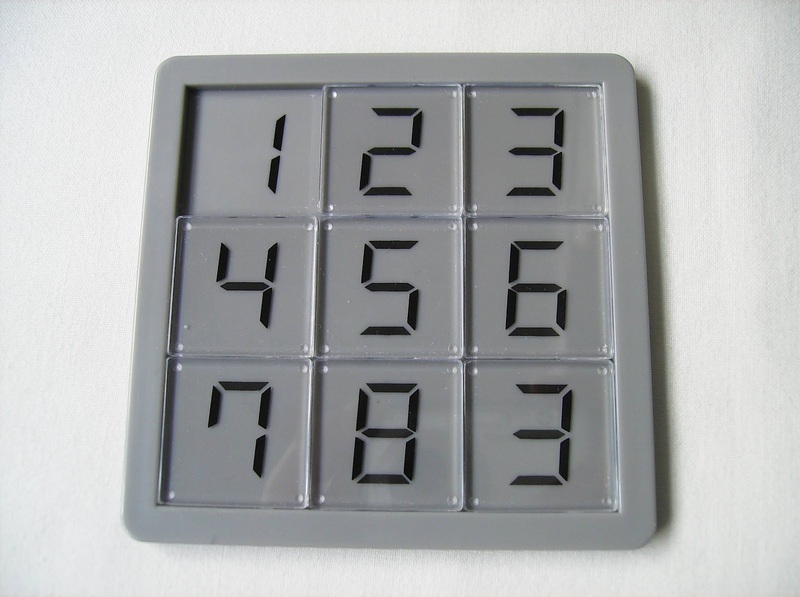 This ingenious design depicts the numbers from 1 to 9, in a 3x3 grid, in the digital form of seven-segment display characters. The "twist" is that the segments from each number aren't all printed on the transparent tiles - some of them are marked on the tray. 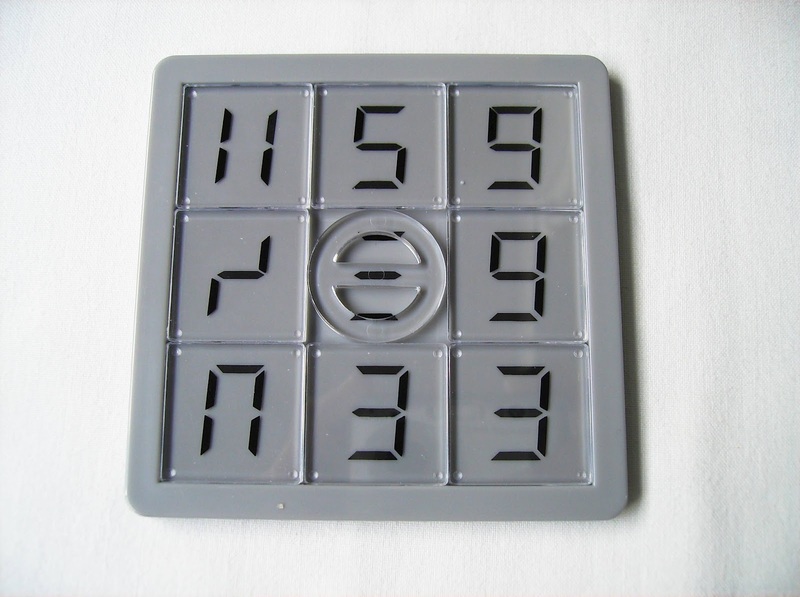 This way, as you slide each tile inside the frame, the number appears to be scrambled as if your digital wrist watch/alarm clock was out of whack. This cool effect is what makes the design so appealing. There are three main challenges that you can attempt to solve (just by sliding the tiles). The packaging of the puzzle is entirely in Japanese, however, it's easy to recognize by the pictures what needs to be accomplished. 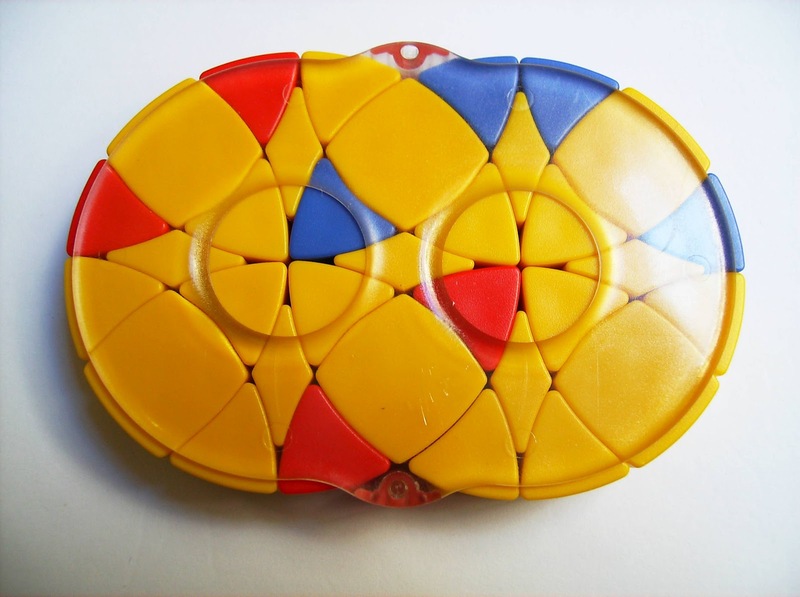 The first challenge is common to every slide puzzle - just scramble the tiles and then return them to their original pattern. This is relatively easy for anyone that has solved the classic 15 Puzzle. The next two challenges are exactly what gives this puzzle its "Impossible" connotation. The second challenge, or first of these two impossible tasks, requires you to swap the last two tiles by making a sequence of 1, 2, 3, 4, 5, 6, 7, 9, 8 and solve it into the correct arrangement. Now, if you're familiar with the slide puzzle concept and history, you know that the presented challenge will create a parity error, because it requires a transformation of an even combination to an odd one. But there's a way to overcome that by taking advantage of the puzzle's concept. Spoiler ahead: If you look closely at the photo of the tiles outside the tray (above this paragraph), you can see that the segments that form the number 4 are exactly the same as the ones on the number 9. By making the "4" and "9" tiles swapping places, it becomes possible to solve the puzzle. There is a minimum of 18 moves to solve this. The final challenge is another impossibility: from the solved state, you are now required to make an arrangement of the tiles, also just by sliding, so that it shows the sequence 1, 2, 3, 4, 5, 6, 7, 8, 3. Again, how is it possible to have two of the same numbers appear on the same frame? - There are two solutions for this, one that uses a minimum of 24 moves and another with only 20 moves. 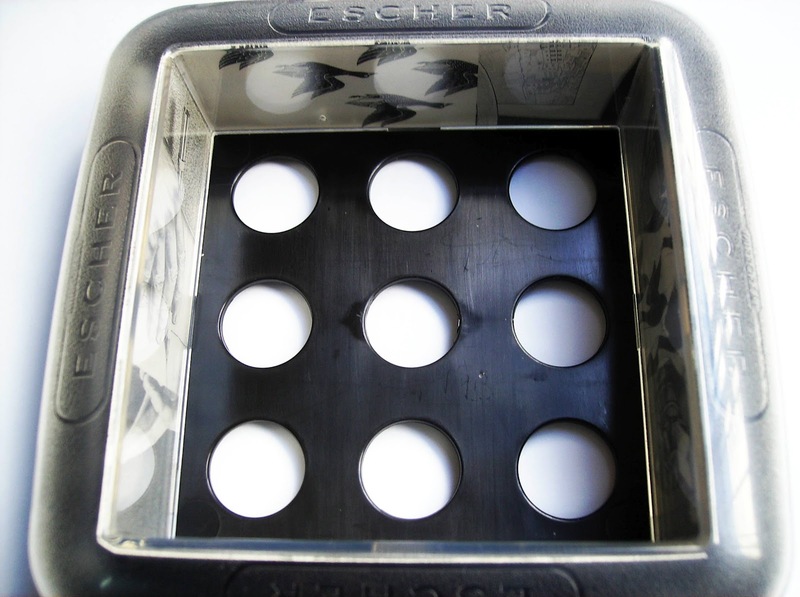 Spoiler ahead: By looking again at the photo of the tiles outside the tray, there are exactly two tiles that can form the number 3 on the frame. One is being used by the "3" in the first row, and the other is being used to form the "7". The first think that comes to mind is, "how to show in the same frame a 3, a 7 and another 3?" - The answer lies in the way you can form a 7. 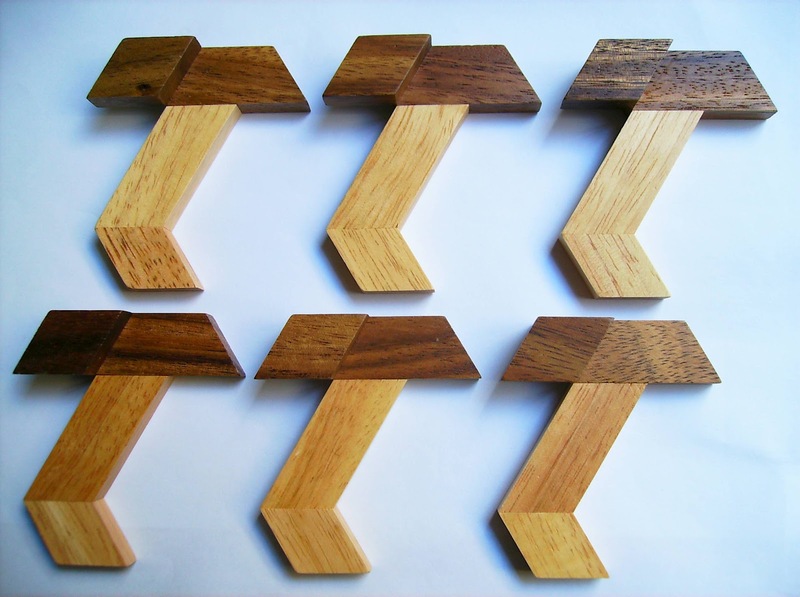 The first is just with three segments and the other, the solution, is with four (see the difference in the photo, below right). So, the first solution requires a swap of the "3", "7" and "9" tiles to the positions of the "9", "3" and "7", respectively. The second solution, more efficient, requires a swap of the tiles "4", "7", "9" to the positions "7", "9", "4", respectively. Intuitively, it would be more practical to just swap the number 7 with the 9, but it would result in another parity error. 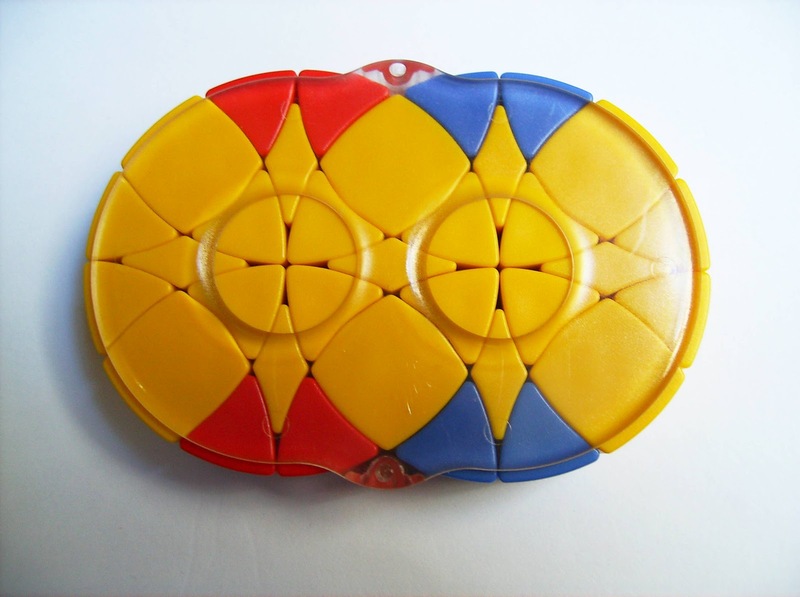 I have seen this puzzle for the first time, a while ago at Rob's Puzzle Page, but whenever I tried to buy one, I couldn't find it anywhere. That was until a couple of months ago, when I found one for sale at eBay. I had to get it before it was too late again. At the time I bought this one, the seller had another copy, but now, unfortunately, it seems to have gone. I checked Hanayama's website, but couldn't find it there either. I believe they're being sold at Amazon Japan, but I'm not sure they send overseas. It was apparently a limited production run and now it's harder to find. 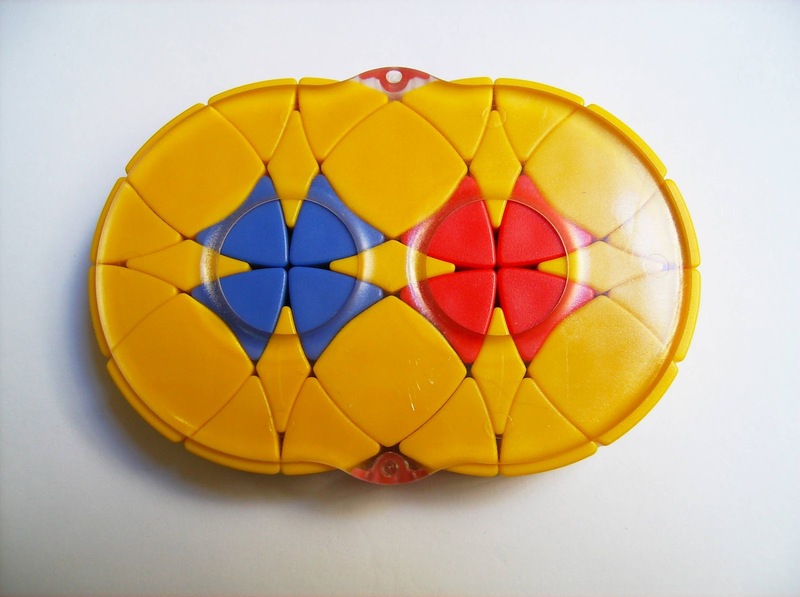 It seems that almost anything was attempted with the sliding puzzle concept before, but Serhiy Grabarchuk Jr. proved that it's still very possible to come up with an original and amazing design... And associated with Hanayama's quality, you can't go wrong with the Puzzle Impossible. Definitely recommended for the Sliding Tile enthusiasts... If you find one. The first time I saw the Trinity Infinity puzzle, I was impressed by its design. 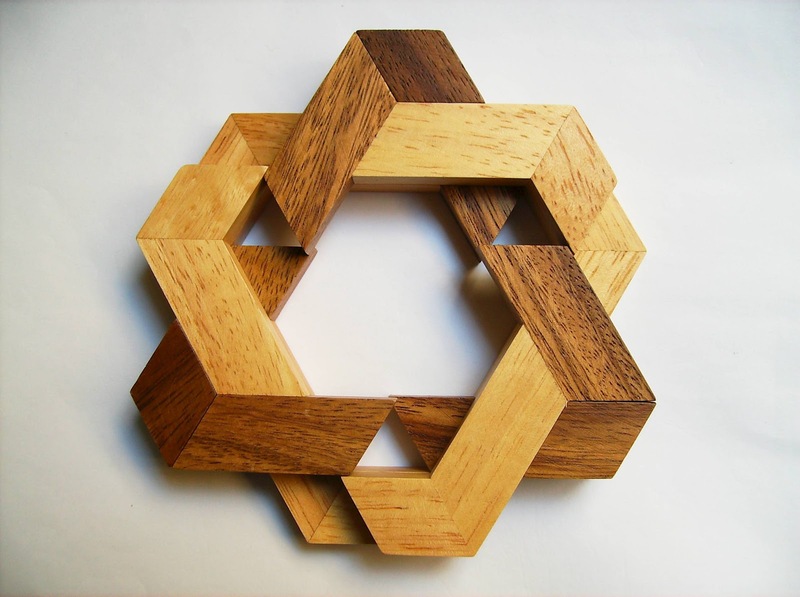 The way the pieces were interlocked, it sort of reminded of the Cast Coaster and Oskar's Lucky Clover. 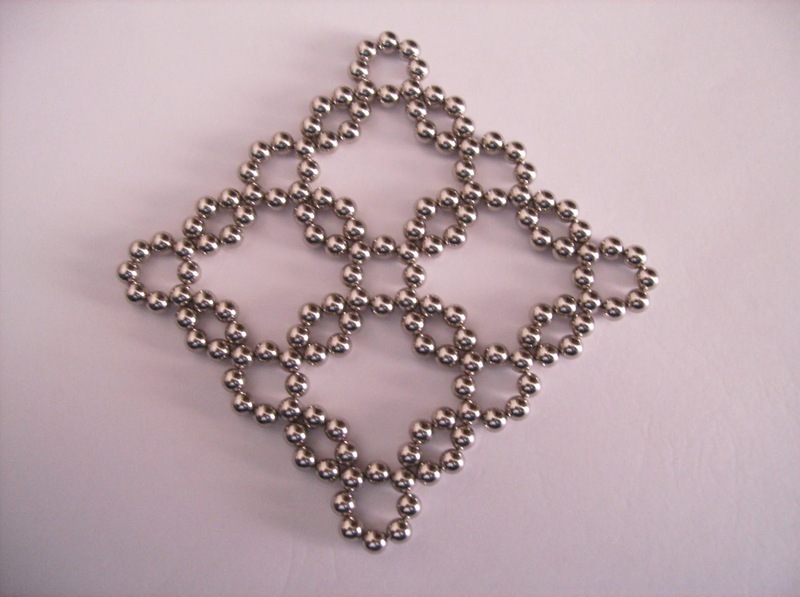 The design is an original by Doug Engel, manufactured by Bits and Pieces and measures 11,5cm x 6,5cm (4,53" x 2,56"). The puzzle is in the shape of the mathematical symbol for infinity, and is comprised of three pieces, with two of them being identical. A nice finishing touch is the tripled colored pieces, which look very nice: one golden, another one silver and the other graphite, make a nice contrast. However, the coating quality on the puzzle's pieces leaves much to be desired. There were noticeable parts where the coating was chipped off and others had a few small dents here and there. Nothing that prevents you from having a full satisfying solving experience, but appearance-wise it does look a little bad and it's beyond understandable. 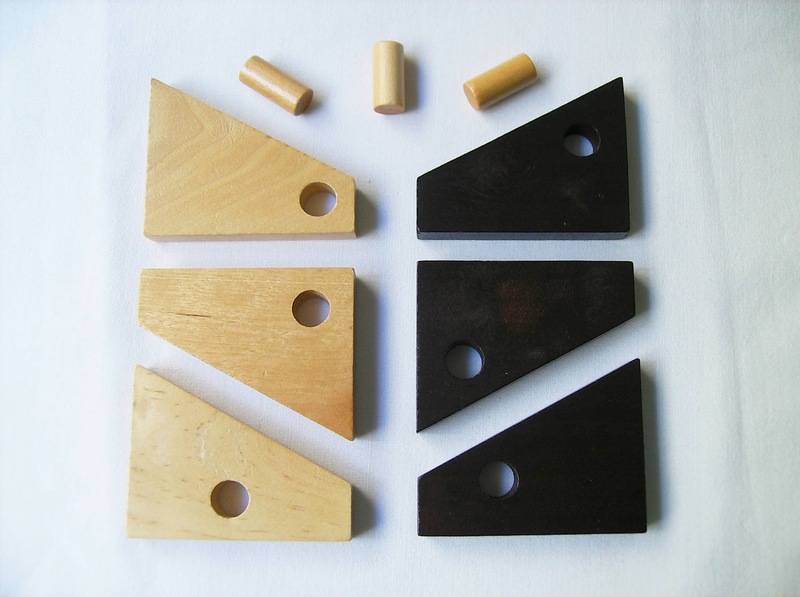 The small price on the puzzle is not an excuse either, because about the same price Hanayama Cast Puzzles are very high quality when it comes to coating. I do have a Cast Marble puzzle that looks awful with bubbles in the coating finish, but that was an exception to the rule. Now, regarding the puzzle itself... 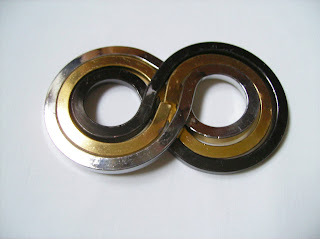 The goal is to separate the three pieces from each other and then reassemble them into their original infinity design. The first part, which is to unlock the pieces, was very easy. Two of the pieces have a gap that is large enough to pass through the piece's thickness and the middle one, the golden, is closed. With very little effort, the pieces were almost separated by themselves. The second part of the task, though, was a bit more tricky. PuzzleMaster rates it as a 6/10, and this time, at least for me, it was more like a 7/10. Probably took me around 15 to 20 minutes to finally figure out their interlocking secret. The key is having the middle piece and one of the other pieces already in their finished state, so that the third one is put in place much more easily. Apparently, PuzzleMaster doesn't have a solution for this one, but if you need any help to solve yours, let me know and I can send you a scan of the solution sheet. Despite the quality of the Trinity Infinity not being the best around, the design and its challenge, especially the second part, is worth it. It's complexity is not something that will scare away casual puzzlers, but if you're experienced with disentanglement puzzles, maybe this one isn't for you. Today, I will deviate a little from the common puzzles I'm used to review. Zen Magnets are to blame, as they're my latest addiction... As if my regular madness for mechanical puzzles wasn't already enough. First of all, can this executive toy be categorized as a puzzle? - In short, my answer is yes, it can. As stated in one description of the word "puzzle": "A puzzle is a problem or enigma that tests the ingenuity of the solver" in Wikipedia. 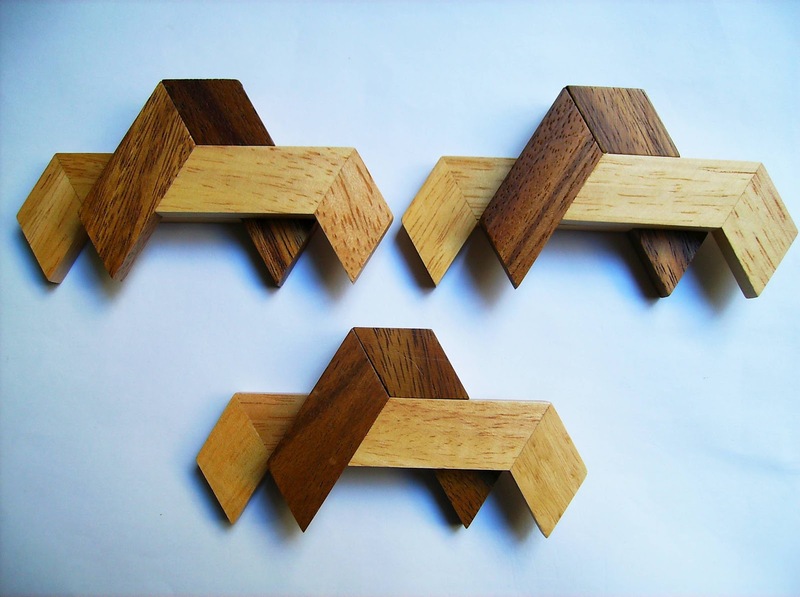 If you set your mind to solve a pattern you saw on a picture with your magnetic set, or you just want to build a structure you imagined, but don't know exactly, at first, how to do it, that's basically a puzzle for you. Now, with the definition of the puzzle behind, I'll describe what exactly are the Zen Magnets. 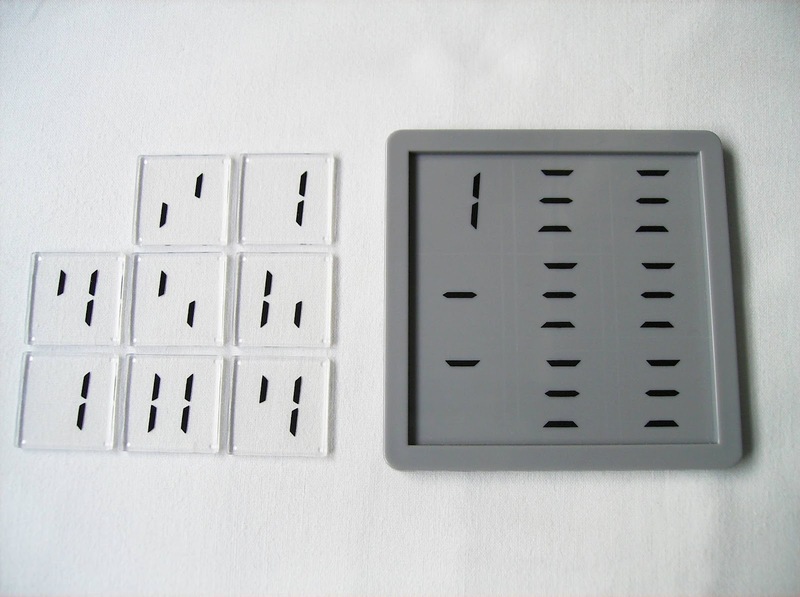 If you browse regularly around the Internet looking for puzzles (like me), you've probably seen these magnetic sets a dozen times before. Every time I'd stumble upon one, I would think to myself: "Yes, you can build a few things out of these, but I bet I would get tired of them pretty fast", and I just continued with my search for the next puzzle. 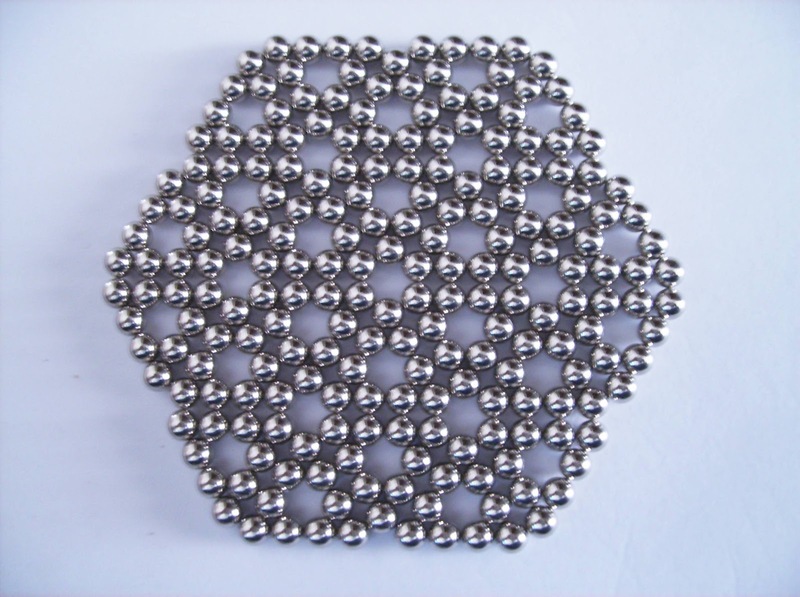 That was until I found out about the Zen Magnets Gallery and was astonished by the sheer amount of beautiful and cool designs you can build with these simple magnetic spheres. It was like stepping into a whole new dimension - I felt this when I first discovered the many types of puzzles that existed, when I started my collection. You can see by the hundreds of pictures, that there are many talented people building all kinds of fantastic and complex designs. Inspired by all those demonstrations, I decided to explore a little more about this subject. They are around since 2008 and they come in many brands and flavors. One thing that I was concerned about, was their overall quality. I read some people's comments that after a few weeks of constant manipulation, the spheres start to loose their shine and most importantly, their coating, which can leave your hands in a mess after playing with them for a while. After careful research, I decided to give Zen Magnets a try, because their quality is supposed to be the best in the market, right now. Also, this video sort of helped me to decide. 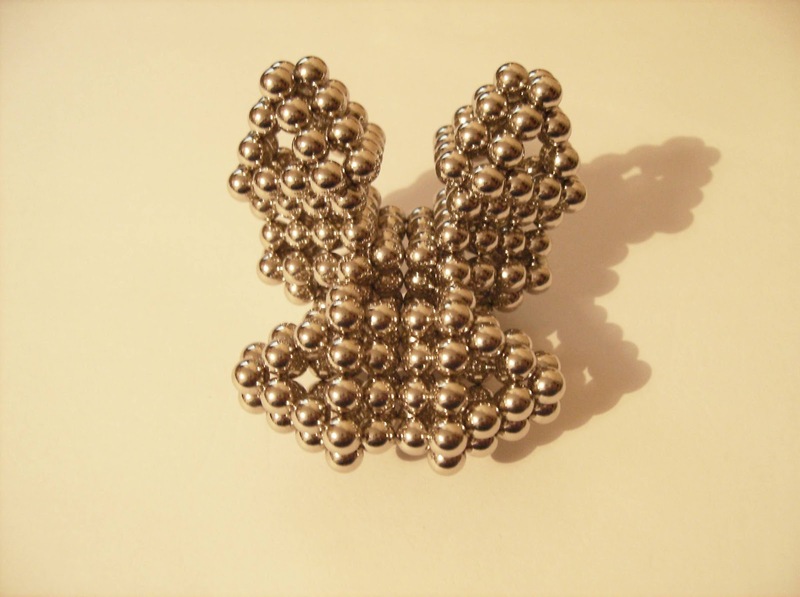 So, what are the Zen Magnets, after all? - Well, they are strong rare earth Neodymium super-magnets, with 5mm in diameter and are coated with mirror polished NiCuNi. They are sold in four different sets: Standard, Gift, Mandala and mini. The Standard and Gift sets come with 216 magnet spheres, a velvet bag and a PVC card (useful to separate groups of spheres), although the gift set has a few extras thrown in (stainless steel plate, microfiber cloth (to clean the magnets), guide and MDF hard case). The Mandala set is the equivalent of eight sets (1728 spheres) for the price of about six... And finally the mini set, with just 72 magnets. 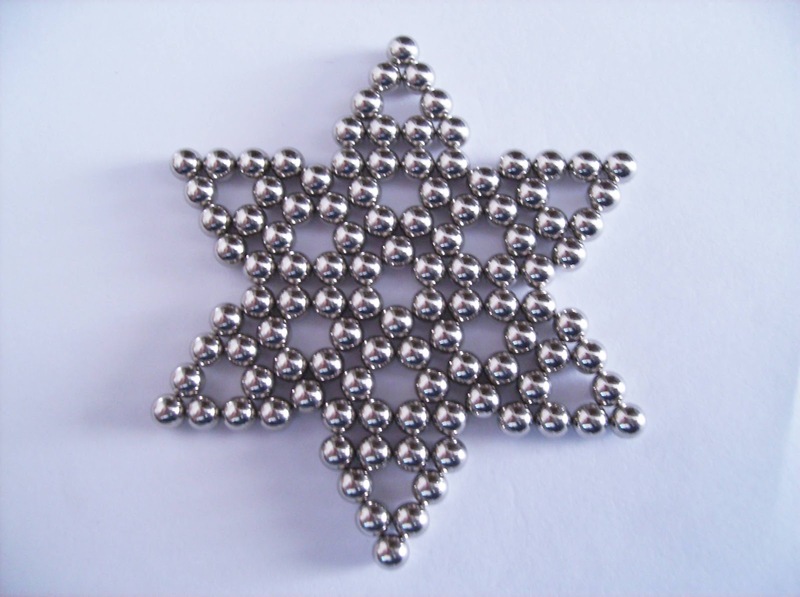 Zen Magnets are also owners of the Neoballs brand, which uses several different coating colors, that will sure make very nice contrasting patterns. 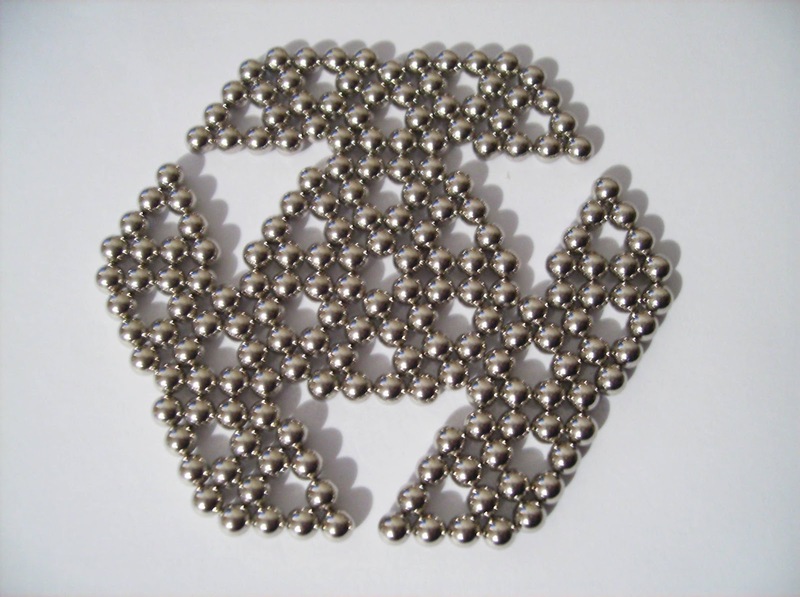 Bear in mind, though, that Neoballs aren't the same quality as Zen Magnets, as they're a different product. I was excited when I first received my Zen set. I got the Gift set, by the way. I was more than ready to start making some cool patterns and 3D structures. However, my expectations came crashing down after a few minutes with the spheres. I'm not referring to their quality, but the easiness of manipulation instead. 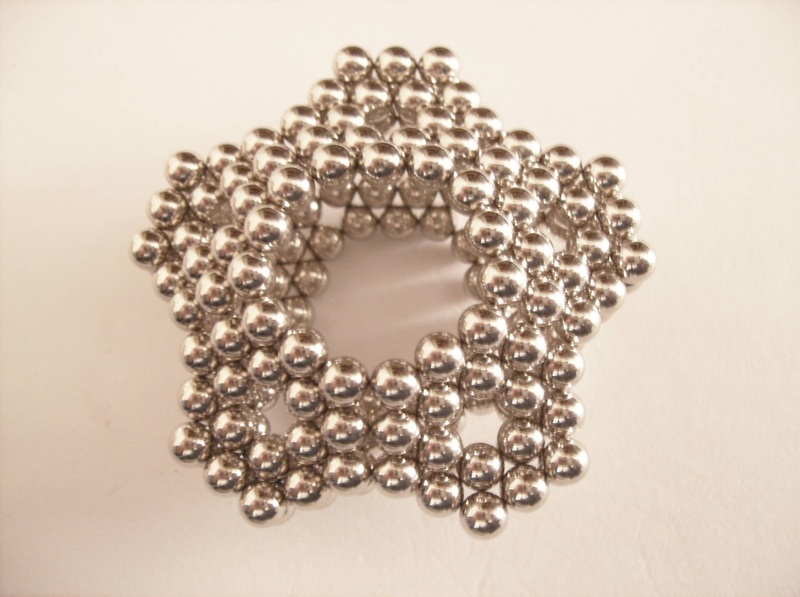 It sure looked easy from the pictures and videos... Every time I tried to make a more complex design, the magnets attracted each other like crazy and the structure would fall apart in an instant. What could I possibly be doing wrong? - Apparently, everything... It seemed that the magnets were too strong to do any serious progress. For starters, I didn't bother to look at the guide before starting to play with the magnets. 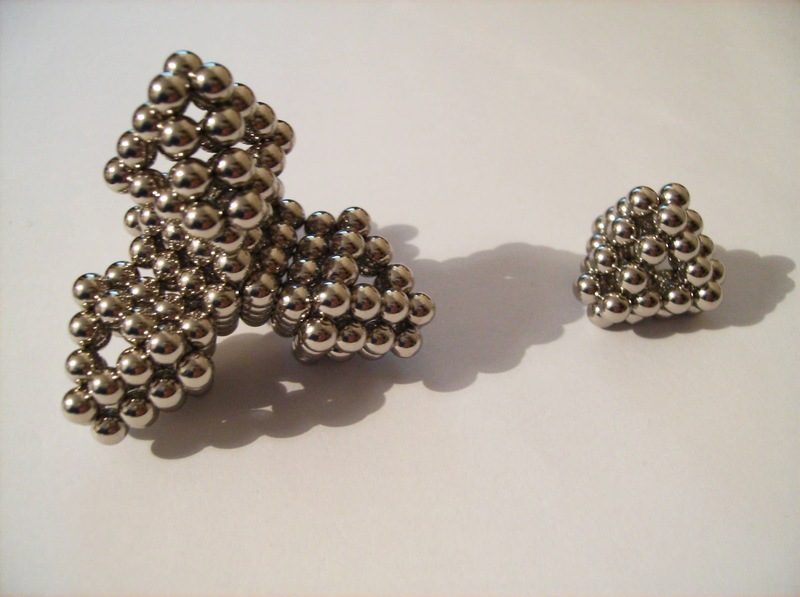 How difficult can it be to snap magnets together, right? 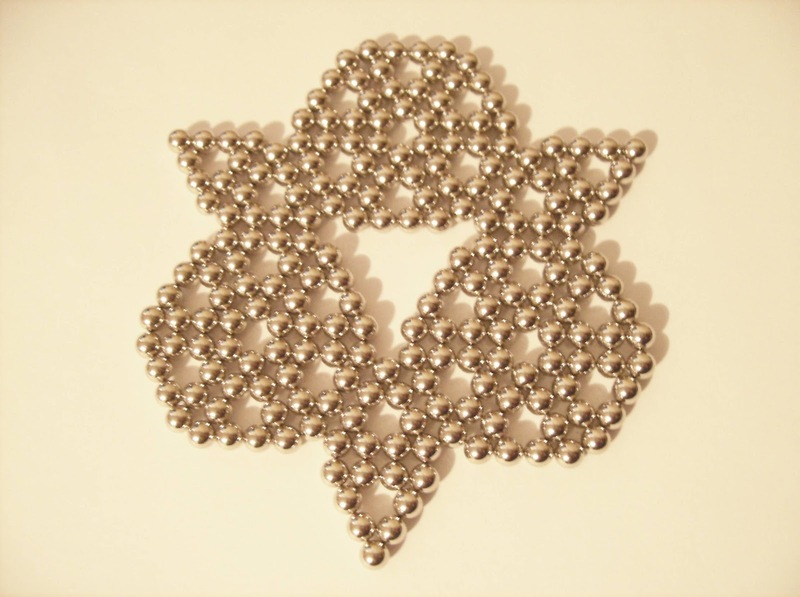 - I guess I overlooked the fact of the magnetic polarity on the spheres. 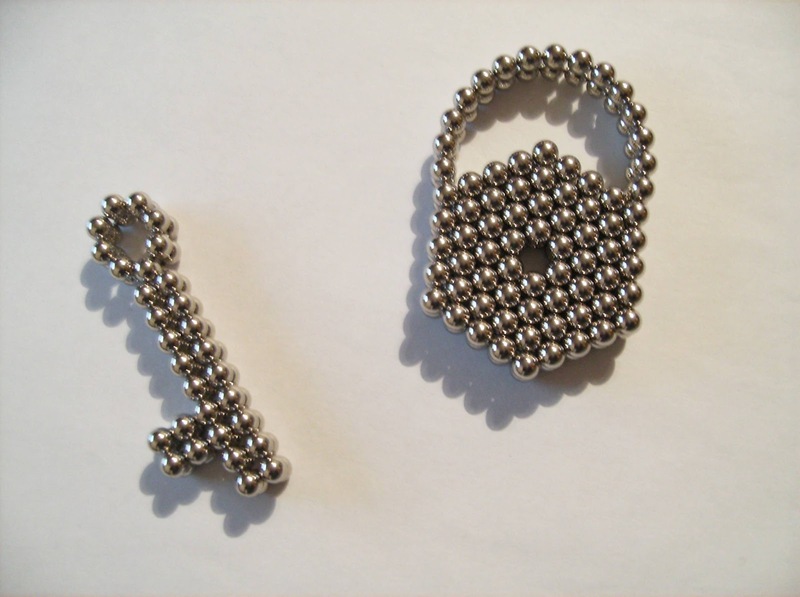 I know that magnets have a north and south pole, I just didn't think about it. The magnetic polarity compatibility can be grouped in two types, coupled and linked. 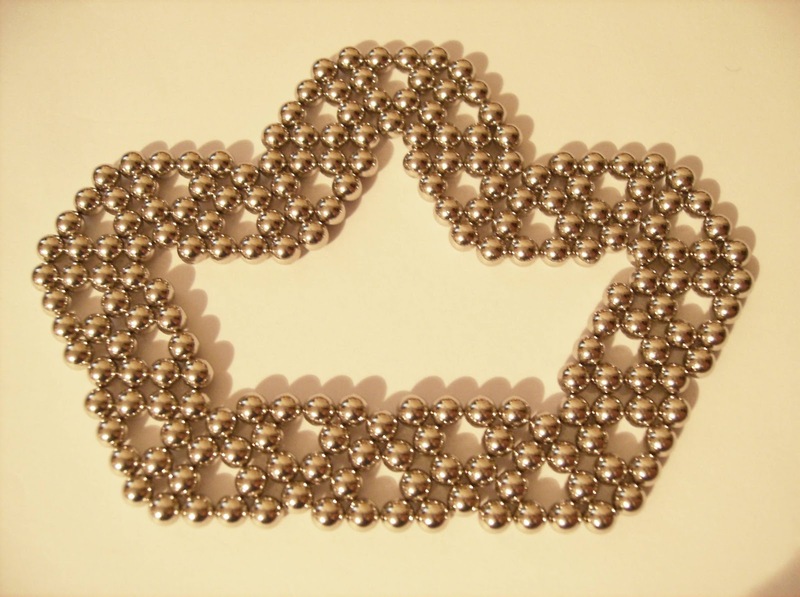 Coupled chains have the magnets parallel to each other, whereas the linked chains have the magnets in an alternating pattern. There are many techniques that you can use to simplify your work and ease your frustrations. You can find many of these useful videos around the web that will sure help you. This all sounds a bit complicated, but trust me, you get used to it with practice. 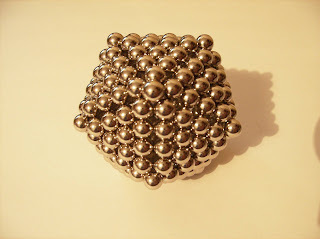 Enough of theory... You might be asking, what exactly can you build with the magnetic spheres? As you probably already saw from some photos above, you can pretty much, build anything you can think of. The only limitation, besides having a small amount of magnets, is your own imagination. 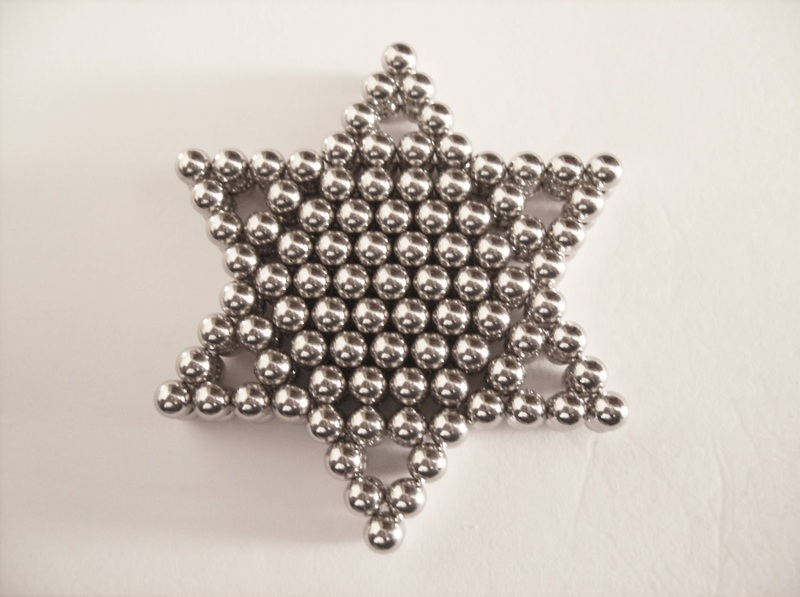 Think of it as magnetic Plasticine: from 2D patterns to some of the more complex 3D designs, every object can be recreated to perfection, provided that you have enough spheres to work with. I could go on and on about these fantastic spheres, but I fear that the review is already too long, so I might as well conclude. 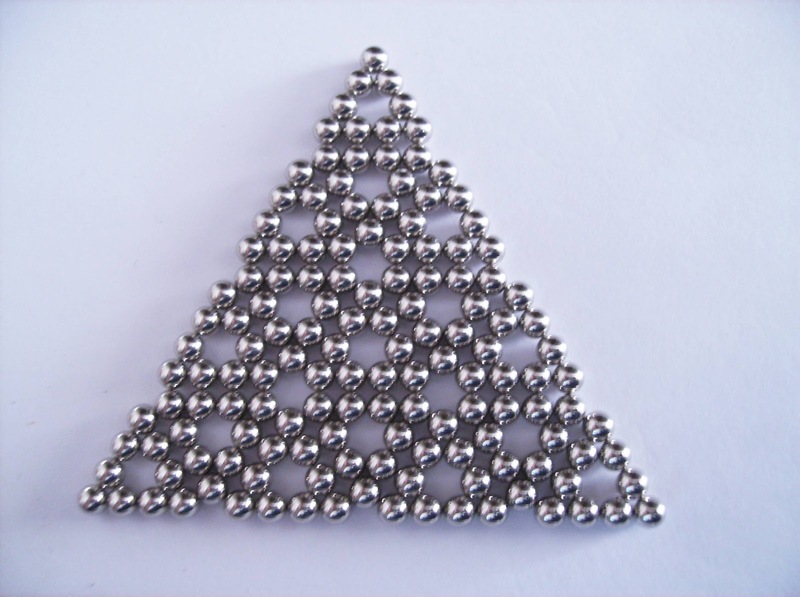 Even though I feel like I've just scratched the surface, I think the information I wrote is enough already, to show you what you can do with your Zen Magnets. I just have to apologize for the photo quality, as I found it extremely difficult to photograph the magnets and keep them in focus. I do believe that it can give you a pretty good idea of the patterns being shown, but there's a lot more you can discover for yourself. Update (22 Feb.) - I have received a few more Zen sets and I feel I must mention the PVC cards that come with every set. I didn't get this notion when I had just one card, but now I discovered that they are a very worthy addition to the Zen package. They are made by Phil Lewis and display a magnificent art image. Each set comes with a different image, so even though you know that you'll be receiving a Zen set, it'll always be a pleasant surprise to discover what new image is on the card. You're not just collecting the magnets, you're also collecting the cards. 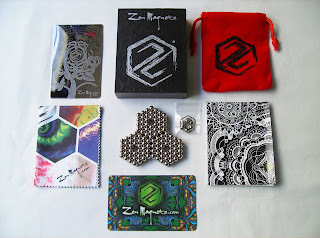 The Zen Magnets sets can be purchased, either from ZenMagnets.com or from ZenMagnets.co.uk, if you're from this side of the Atlantic. For the past two weeks, I've been fascinated with the potential of this creative tool. It's the perfect distraction from your everyday boring tasks and above all, it can be quite therapeutic and stress reliever. The Zen Magnets were a wonderful find and I will probably be getting more of them in the future. My only complaint? - When seeing all those amazing designs at the Zen gallery, with thousands of magnets, 216 of them seem so little, it's frustrating. One set should come with, like 500 magnets, at least... If you're thinking to buy a set of these, be careful though, as you might get hooked for a long time.